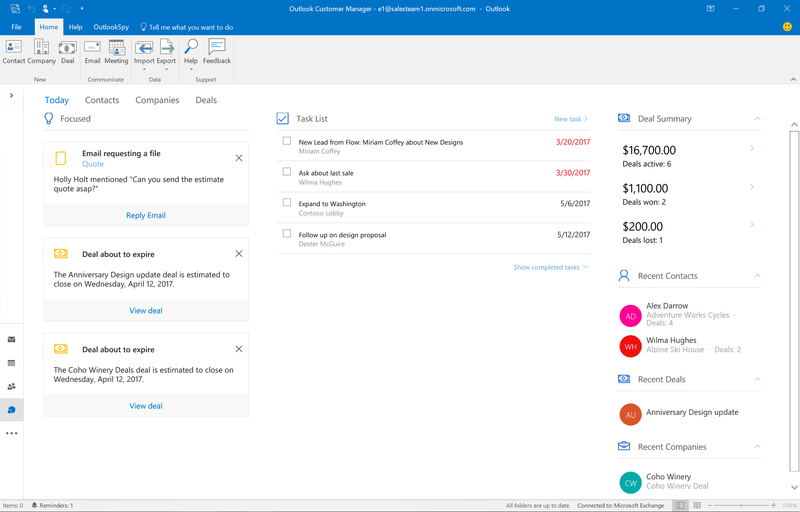 As you work with Outlook Customer Manager, you can add tasks to your contacts, companies, and deals to keep on top of things. Also, the program will learn which of your customers, contacts, and deals are the most important. You can view those items at the top of any Outlook Customer Manager view, or on the left side of the Today view. That way you never miss anything. On the Contacts, Companies, and Deals modules, four items are shown under Focused at all times. If your screen isn't large enough to display all four at once, you can choose the arrows to the left and right to move from one item to the next. You can hide the Focused slider by choosing the ^ next to Focused. To interact with any of your focused items, choose the item to open it in the right hand pane. When Outlook Customer Manager finds something interesting on a contact, company, or deal, that information will be highlighted at the top of the card. For example, if a deal's close date has passed, you'll see a banner at the top of the deal letting you know. You'll see the same type of information highlighted on the Today page. You can interact with the highlighted item directly from the insight. Additionally we will show you emails that need your attention. These emails could be questions from someone, a meeting request, or a file request. You can open the email or schedule a meeting directly from the Today page.